Born in Kumpur vdc, of Dhading District, Nepal. He is known for his sense of responsibility and honesty. He like to do all kind of adventurous and has years of work experience in trekking sector. He started work as trek guide as well as rafting guide in the age of 15 years old. He were working 15 years for Himalayan Encounters Pvt. Ltd & Interpret Travelers. Also, worked one year in X Guide Pvt. Ltd. He has good communication skills. He did various popular expedition such as; Everest Base Camp (EBC), Annapurna Base Camp (ABC), Mardi Himal, Dhulagiri Base Camp, Kanchanjhanga Base Camp, Manaslu Base Camp, and Lantang etc. 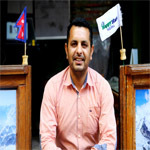 Now he is the Managing Director in Happy Hari Treks & Expedition Pvt. Ltd. Similarly, he has done rafting in different thrilling river like; Votekoshi, Sunkoshi, Trishuli, Tamur, Karnali, Seti, Veri, and Kaligandaki. Likewise, rafting in internationally like; India, Austria, and Thailand. Moreover, he visited different countries such as; India, Britain, Ireland, Switzerland, France, Germany, Holland etc. Hari Bahadur Gurung born in Everest region on 1976.Being born in the Himalaya,up and down to the hill was the daily activities on childhood.So,Hari made a friends with Himalayas by born.After involving in tourism field, Hari polished his career by travelling different areas of Himalayas. Hari has worked in internationally renowned travel and trekking company for over 15 years. Now, to utilize these experiences he involved in his own business. He has trained in different skill development programs in this field such as; trekking guide, tourist guide and wilderness first Aid e.t.c. All his experiences gathered in tourism field and his passion is to expose all unique features of Nepal to You.